Kate and Chelsie: Have You Heard? 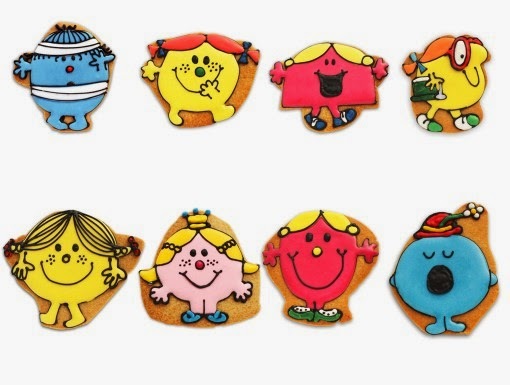 : The Biscuiteers team up with Mr. Men and Little Miss to bring your favorite characters.. in icing!! Have You Heard? : The Biscuiteers team up with Mr. Men and Little Miss to bring your favorite characters.. in icing!! On Wednesday 12th March we were fortunate enough to be invited to the beautiful Biscuiteers Boutique in London for the launch of their new fun and playful ‘Mr. Men and Little Miss’ collection. For those of you who are not familiar with this boutique it may very well remind you of your favourite childhood candy store. The boutique is filled with their captivating creations that included bespoke cakes, traditional sweets, hand iced cupcakes, hand iced chocolates and their new and tasty macarons combined with a warm and friendly atmosphere. The exclusive ‘Mr. 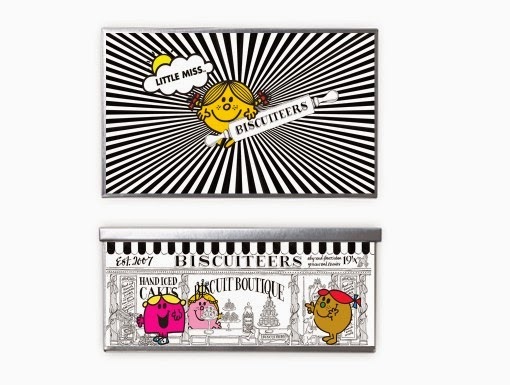 Men and Little Miss’ collection took over 1 year to produce ensuring that the Biscuiteers perfectly captured the different personalities behind each of the beloved Mr Men and Little Miss personalities. We began by sampling some of their colourful Mr Men and Little Miss cupcakes. The cupcakes were beautifully presented, and vivid in colour; admittedly it was a difficult choice to select which character we wanted to try first (Little Miss Sunshine or Mr Messy? But Mr Tickle looked so cute!) So in the end we went with Mr Greedy and Little Miss Chatterbox. The cupcakes were divine! We were simply smitten with the vanilla butter-cream and delicate soft sponge within the cupcake and it left us eager to try more...perhaps selecting Mr Greedy was appropriate for me? For us the best part of the evening was when we were where invited to sit down and create our own Mr. Men and Little Miss biscuits at their icing cafe (on premise in London). The tables were beautifully presented with Mr .Men and Little Miss table cloth, a large bowl of vivid coloured icing pipes, illustrations of the Mr. Men and Little Misses we would be creating to ensure that we wouldn’t forget any details and lots of biscuits to get practising on! We were given an introduction to icing by one of the artists behind the Biscuiteers collections. The lady was delighted to share with us best practise and helpful tips which undeniably helped us when creating our own. Whilst admittedly it was a little tough to begin with, we soon got the hang of it and it was a great fun. The evening ended with us taking our collections away in elegant Biscuiteers packaging and wanting to indulge further in this magical collection. This is priced at £30 per box, not including postage and packaging. This is priced at £27.50 per box, not including postage and packaging. In addition to the hand-iced biscuit and cupcake ranges, Biscuiteers will be also be offering Mr. Men and Little Miss themed icing parties in the Biscuiteers Notting Hill based Biscuit Boutique and Icing Cafe. A team of expert Biscuiteers icers will teach you all the skills you need to create and ice your own tin of Mr.Men or Little Miss character biscuits. You will also take away a 100% cotton Biscuiteers apron and oodles of Biscuiteers tips and techniques- to ensure you can re create the magic in your home.